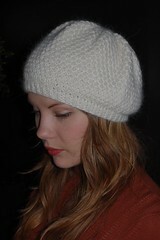 I just couldn’t hold back any longer… I just had to spill the beans and show you my Sally Hat! Doesn’t it look so cute? Granted, I am terribly biased. But hey, I am very very content with this little hat. And of course… it helps when the model looks cute too! The Sally Hat is kind of a beret. However, one with not so much slouch, just a tiny little bit. Notice how the top has a puckering crown. This is the result of decreasing every row at the top. For this particular design, I do like the puckering. I was not supposed to show this to you yet but I just cannot keep a secret. I am so terrible at keeping secrets! I would make such a terrible magazine editor… My great plan was to show it to you when the pattern would be available for sale. 2. Once design is approved by me, I determine what sizes I am going to offer and then I have to knit them all. This takes up a lot of time! And yarn! 3. Writing out the pattern. 4. Send pattern to test knitter. 5. Arrange photoshoot: model and stylist. 6. Determine which picture is going to be used for pattern and blog. 7. Send pattern with photos to Graphic Designers and wait for them to come back to me. 8. Once final graphic design is approved, it is send off to printer. 9. 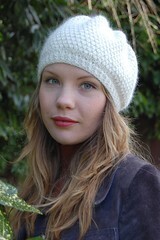 Pattern up for sale at CloseKnit! Today was the photoshoot so right now I am determining what photo will be used for the pattern. Will you help me choose what picture would work best? Oofff… they are all so cute. Which one will it be? Help me out here, will ya? I am speechless…I so want to see this movie now! There are several things I want to talk about in this blogpost. I have been working on several projects at the same time and I am very excited about them all. Let’s go! My Sally Glove pattern has been incredibly succesfull at the store. 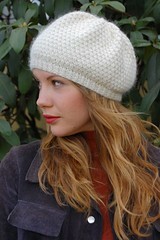 I am so thankful for all those great and generous knitters who all bought my pattern. I am still a bit baffled by it… thanks so much all for your support! 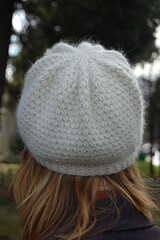 Several knitters have been asking me about a hat. “Design a Sally Hat to go with the Sally Gloves!”, was a request I frequently have been hearing. To stay true to the Sally Glove design, I am using again a 1×1 ribbing with half twist (meaning you knit into the back of loops), and I am using a textured stitch for the main body of the hat. 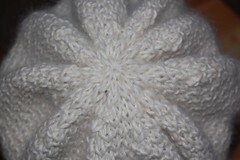 My initial design was going to be a hat where I apply a swirl decrease for the crown but alas, it didn’t work out with the main stitch pattern. It just wouldn’t line up and my sequences were therefore totally off. It looked like a mess but I quickly adapted my idea and choose a decrease crown which perfectly matched up with the stitch pattern. I need to work on the second prototype and hopefully I won’t have to start a third prototype. The sooner I can finalize this, the better. Lately, I have been very drawn to the brand Karabella. They make such beautiful and classy yarns, I am just so very smitten by their products. 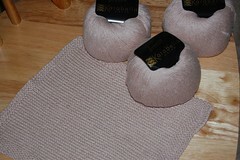 During the Sale last weekend, I picked up a whole bag of Karabella’s Breeze, a Cashmere/Merino blend. 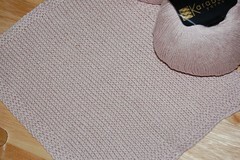 It knits up so wonderfully and I made a big swatch to see how the yarn behaves and to see whether it is really talking to me. It is talking to me allright… it has a very soft touch and a nice drape. I am thinking a nightie, a short kimono robe, but I am also eyeballing this beautiful design from Stefanie Japel’s latest book GlamKnits. It’s the Romantic Bell Sleeved Cardi. I haven’t made up my mind yet. I am still sleeping on it, but this much is true: I am going to knit something fantastic with this gorgeous yarn! Sally is killing me. Killing me, I tell ya. How in the world am I supposed to bring a paycheck home if my boss is constantly buying in GORGEOUS yarns??? This is going to become a sweater! I am so excited!!!! And now I want to make one in black. Woooohooo!!! Yup, started another one! This time with my precious Qiviut yarn of $82.– per ball. But oh…let me tell you… it is WORTH every dollar. 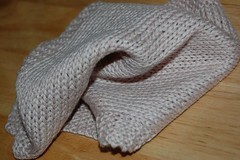 This fiber is so incredibly light, warm and so deliciously soft. It also has beautiful depth in color and a fantastic halo. I am not as obsessed like I was with the first two Smoke Rings, though. I am taking my time with this one! 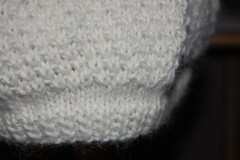 I signed up for this Double Knitted Glove pattern class and last night was the very first workshop. I was very excited about this class because I was getting kind of bored and was ready to learn some new techniques. In this class, taught by Judy Taylor, I learned how to “double knit”. 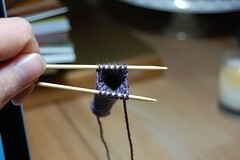 This entails knitting in the round on two straight needles. 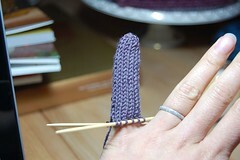 It is my very first finger I knitted on two straight needles! I am so baffled and happy at the same time. What a beautiful, beautiful technique! I just cannot wait to finish my glove. People, this is a wonderful class. 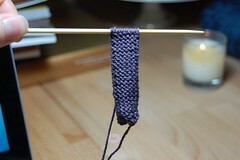 If you are an advanced knitter and want to learn how to do this, I recommend you to take this class. Okay, that’s it for now…Thanks for reading and until the nexy entry! 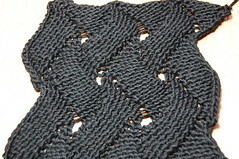 You know me… I just have to knit multiple projects of the same pattern… I just needed to see how this pattern looks in black yarn. And I am loving it! Of course I had to make modifications again. 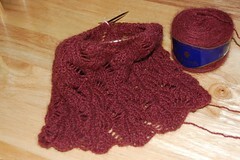 Instead of 168 stitches, I casted on 140 and then followed the charts in the order it is given in the pattern. By casting on less stitches, it fits snugger around my neck. 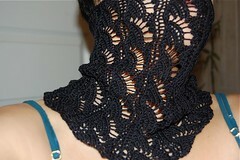 I did not make it very long, it’s just a little black cowl! Black yarn is not that populair. 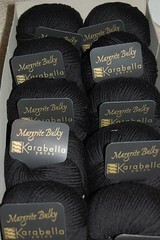 Seldom do I see knitters working with black yarn and very seldom do I see black lace weight being sold in yarnshops. I can see why. Really, who wants to look at the color black for weeks and weeks on end? 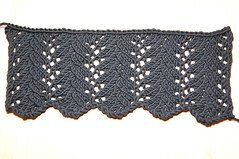 Besides that, when one works with intricate lace patterns one wants the pattern to show and black is hardly chosen in that regard. A little black dress with low neckline, high heels and a black lace weight smoke ring draped around my neck? Oh yes… I can totally see myself wearing that. 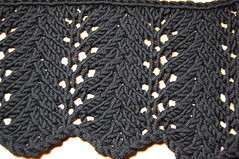 Swatch #1: Vine Lace. 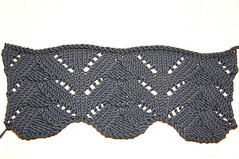 A very elegant lace stitch with only 4 row repeat. 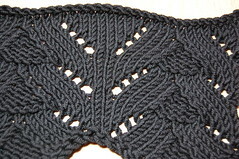 Swatch #2: Double Wing, open work version. Almost make me think of Art Noveau/Art Deco Style. Swatch #3: Scroll Pattern. Makes me think of wings of birds. Has a Japanese feel to it, in my opinion. Both front and back look very pretty. 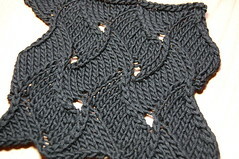 Come to think of it, these stitch patterns aren’t that open but still look pretty in black. 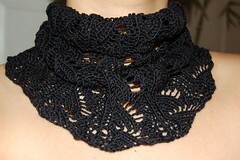 My alltime favorite for black yarn, however, is the Flared Lace Smoke Ring pattern! You are currently browsing the Getting Purly With It blog archives for February, 2009.